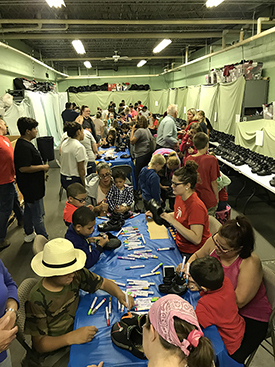 There was a line through the parking lot and down the street when the doors opened for a recent shoe-giveaway event in Hagerstown, MD. 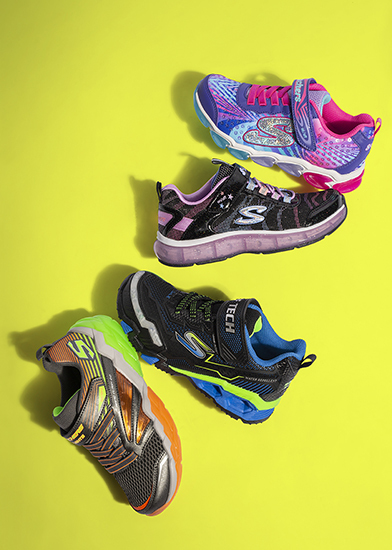 Partnering with Super Shoes, BOBS from Skechers donated over 1,000 pairs of shoes to local children through the charities Children in Need and Delivering Good. 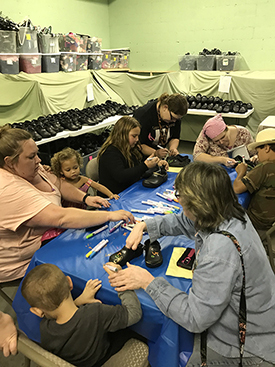 Volunteers from Children In Need, BOBS from Skechers, and Super Shoes fit hundreds of children for their own pair of BOBS by Skechers shoes. 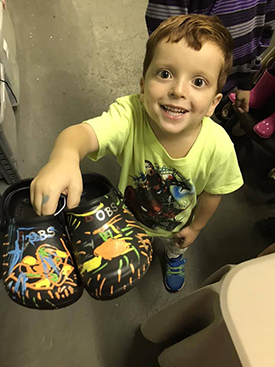 The children then had the opportunity to turn their new shoes into their very own custom artwork. The kids’ enthusiasm was contagious, and quite a few up-and-coming Picassos were discovered in the room! In addition, with the partnership of Delivering Good and Children In Need, each family was provided with food to take home that evening. Founded more than 30 years ago, Delivering Good is a non-profit organization that unites retailers, manufacturers, foundations, and individuals to support people affected by poverty and tragedy. More than 98% of revenue is dedicated to Delivering Good’s charitable program of distributing apparel, accessories, shoes, home furnishings, toys, books, and other useful items. Since its founding, over $1.6 billion of donated products have been distributed through Delivering Good’s network, serving both individuals and families affected by poverty and disaster worldwide. Children In Need of Washington County is a non-profit founded in December 1998, to provide children in Washington County, MD the necessities needed for learning. Children In Need currently serves more than 1,104 families, including 2,700 children. This organization seeks to provide each Washington County child living at or below the federally recognized poverty level essential items and education supplies to ensure their success in school.